In its essence, Yoga teaches us of unity and connection through mind, body and breath and the practices bring many benefits to our physical, mental and emotional health and spiritual unfolding. Yet during pregnancy, such connection has the potential to be beyond anything we have previously experienced as we experience the deep and mysterious connection with our baby growing in our womb; the physical and the spiritual combine as our baby, a tiny being in his or her own right, begins life within our body. Yet as pregnant women, we are rarely pregnant in a bubble and the busyness and demands of the outside world continue to bear their weight upon us, demanding as much from us as ever before. It is easy to see how we can become depleted and exhausted, struggling to continue our lives as before whilst the joys and challenges of pregnancy play out within our bodies, minds and feelings. We may take time to prepare the baby clothes, nappies and nurseries, yet let us not overlook the importance of caring for our minds and bodies as it is we ourselves who are our baby’s first home. Attending the Pregnancy Yoga class ring fences a little time and space each week where our focus is solely upon ourselves and our baby. It is from this precious time that we can begin to nurture ourselves as mothers, care for our bodies and minds, connect with our baby and prepare ourselves for birth and motherhood. Pregnancy Yoga is a gift to ourselves and our unborn babies and can set the tone of self-nurturing which is of vital importance in our unfolding journey as mothers. The more we love and nurture ourselves, to more we are able to love and care for our babies. Stretch & Strengthen Yoga postures suitable for pregnancy gently stretch our muscles, easing tension, improving posture and building strength, balance and flexibility. The postures are specially adapted for pregnancy, and help women to enjoy a good stretch, and feel toned, strong and light throughout pregnancy. Prevent and Ease Discomfort Pregnancy can bring back pain, Pelvic Pain, sore shoulders, heart burn, swollen wrists and ankles and many other niggles and discomforts. I tailor the Yoga practices to meet the changing needs of the women in the class. The gentle postures ease and prevent back pain by learning how to actively carry our babies, stabilise Pelvic Pain, develop good posture and core strength and provide relief from many other pregnancy discomforts. Release Stress & Anxiety Pregnancy is a time of great change and the many uncertainties can take their toll on our minds, leaving us feeling stressed and anxious. Gentle breathing practices, relaxation, meditation, affirmations and visualisations take us to a place deeper than the anxieties of our minds and connect us to a place of deeper, unwavering peace, calm, strength and wisdom. We can access this place of calm to support us during times of stress, to guide us during labour and as we navigate our way as mothers. Preparation for Labour & Birth Yoga postures, breathing, relaxation and affirmations can provide excellent support during labour and birth. Each class contains some birth preparation, and I provide much information about the process of labour and birth and how we can work with ourselves rather than against ourselves to enable women to feel empowered, excited, confident and prepared for labour. I am also experienced in supporting women preparing for VBAC, Breech and Home Birth, and you can read women’s experiences of how effective the Yoga preparation was during birth here.Women learn how to work with their bodies and their labour, rather than working against themselves, and have a safe space within which to talk about their feelings towards labour, birth and mothering with others. Women approach labour with experience of a wide range of postures and practices which they can draw upon in labour, and women say this enables them to feel excited and confident as the big day approaches. Drawing upon my experience of training as a doula with Michel Odent, I often talk about the needs of women in labour and the ways we and our partners can help to ensure these needs are met wherever and however we choose to give birth. Optimal Foetal Positioning Each week we practice postures which support our core strength and posture and bring our babies into the most optimal position for smooth, uncomplicated birth. We explore the theory of Optimal Foetal Positioning and explore the many postures which can encourage our babies into the most favourable positions. We also explore how we can use these postures in daily life and to ease aches and pains outside of the class and during our labour and birth. 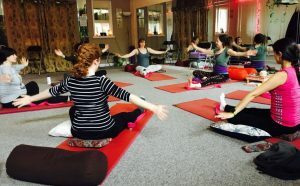 A Sense of Peace & Relaxation Everyone’s favourite part of the class; learning to consciously, deeply release tension from every part of the body, and then create a sense of love, peace and relaxation which you carry with your into the rest of your day. Relaxation builds our inner reservoir of peace, calm, strength and wisdom, to be called upon in labour and mothering. Relaxation is also very useful to practice when you’re awake in the night and can help with anxiety and insomnia. Connection to your Baby Life is busy, and in pregnancy is gets busier. especially so if we have children already, and we can feel like the weeks of pregnancy whizz by and we barely have time to think about this new baby, and then of course the guilt sets in. Pregnancy yoga offers the chance to connect with our growing baby through simple postures and breathing, and cultivate an inner world of love, sharing and connection. Research shows that our babes in-utero share our feelings, so imagine their delight as we connect with them from a place of unconditional love, welcome and excitement. Connecting with our baby during pregnancy works to form us as mothers; we learn to make space for our baby in our body, mind, heart, home and relationships. . Connection with other Mothers A central part of the class is the time and space to share, talk and connect with other mothers. As women, there are so few spaces where we can come together to genuinely share our hopes, fears, feelings, plans and vulnerabilities. Each class creates a safe and nurturing space for mums to share their pregnancy experiences and to support one another with friendship, empathy and kindness. Many friendships are formed in the pregnancy yoga class, with women going on to meet up regularly once their babies are born. Post Natal Recovery Having practiced Yoga during pregnancy, you will have developed an awareness of your body, as well as core strength, a calm mind and a toned pelvic floor. These practices will support your post-natal recovery and transition to motherhood, and you will be able to use your knowledge of breathing and postures to nurture your post-birth healing as well as learning more at the Post-Natal Yoga Circle. Nurturing ourselves is something many of us find difficult, for many reasons, and it can feel difficult to find the time amongst all the things we are busy with, yet just a few minutes of conscious breathing, hands gently resting upon the curve of your belly, connecting with your baby within, can wholly rearrange your inner world. Likewise, a few cat postures and gentle stretches can relieve tension and prevent back pain and bring your baby into a favourable position ready to be born. I genuinely love teaching Pregnancy Yoga and feel honoured and blessed to work with women at this special time. Discovering the gentle, nurturing approaches of Pregnancy Yoga are not only wonderfully supportive during pregnancy, but can bring forth a new, beautiful, beginning in your relationship with yourself and your children, and can bring you sustenance and support throughout your years of mothering. I look forward to welcoming you to the class and supporting you on your pregnancy journey.